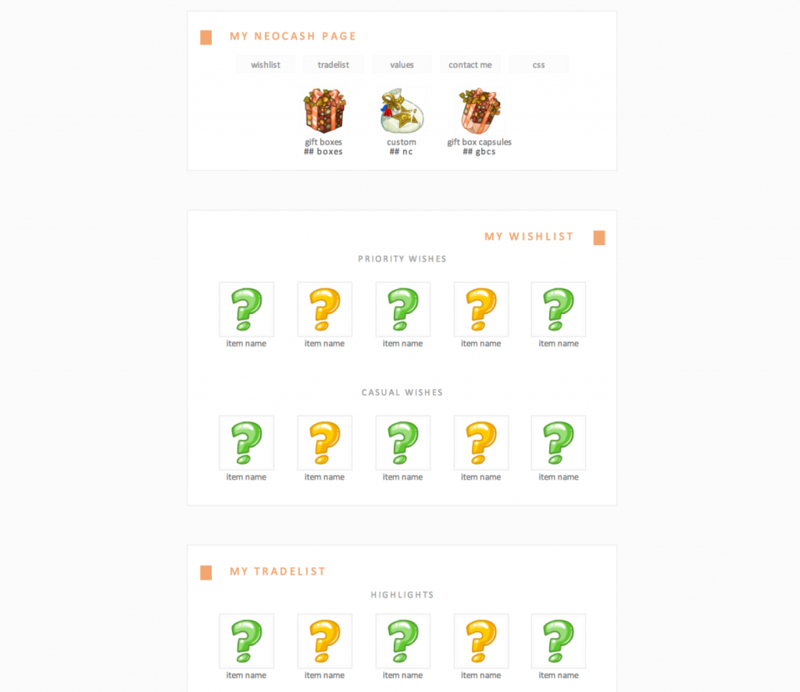 Welcome to Anna's CSS, a premade site featuring clean, minimalistic styled templates for petpages, user lookups, pet lookups and shop layouts. 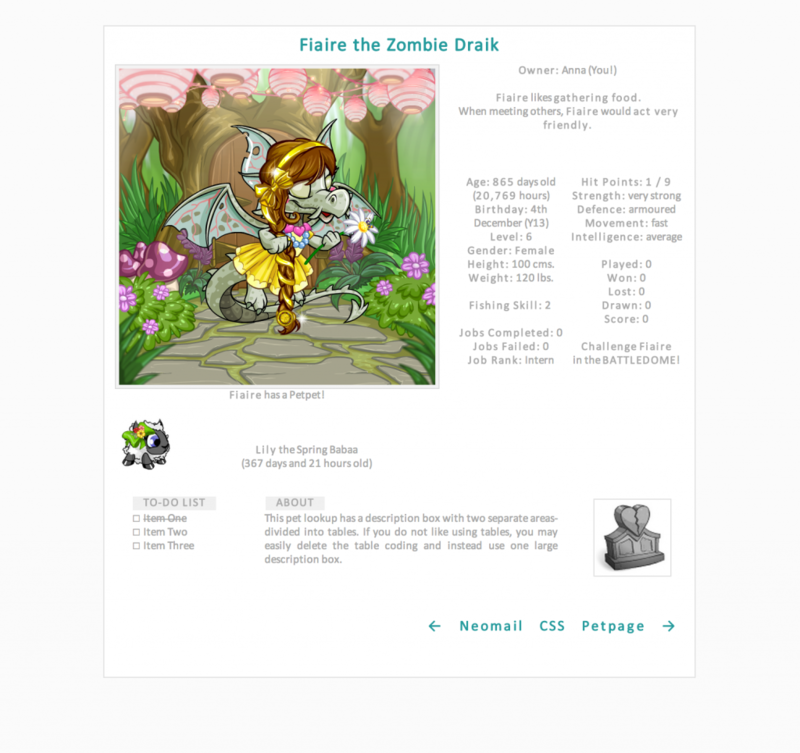 After founding it in August 2013, Anna has worked hard to bring you some of her best templates. Please, show some respect for both myself as the creator and others who would like to use my coding and just leave the credit. Likewise, do not alter or change the credit with the intent of deceiving others or making it hard to locate. two. you can change or edit the css to fit your needs. I do not mind if you change or edit the css to fit your needs. In fact, I will be willing to assist you with any problems or questions that may arise as you change the coding. But remember- just because you edit the css, that does not make it yours! three. theft will be taken very seriously, so behave. Unfortunately, I've had to deal with coding theft several times in the past. Because of this, I do not take coding theft lightly. I have made my work available as a courtesy to everyone; there is no need to even steal my coding at this point. So please behave nicely. I have now made the NC WL/TL page, Smoke and Mirrors more JN wishlist friendly. So you should now be able to import a JN wishlist and not have an issue with table overlap. Hope everyone had a happy holiday!! 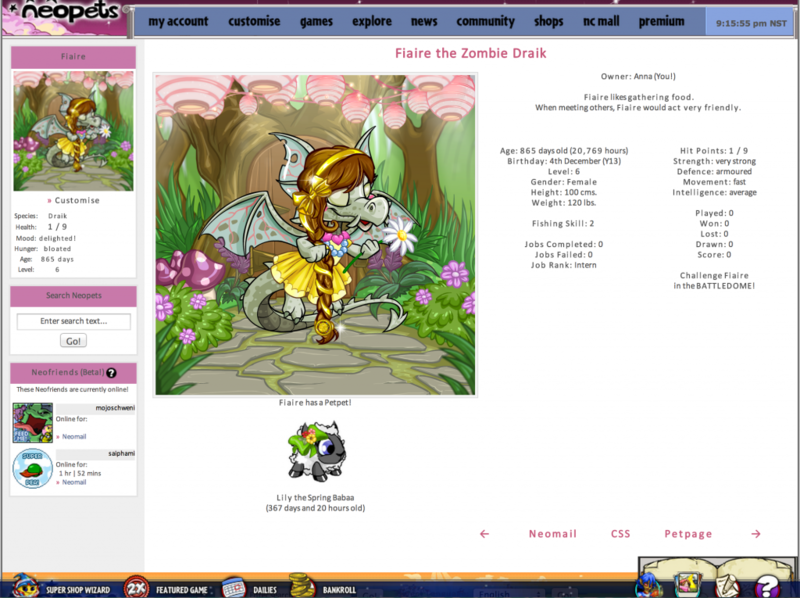 I noticed some users were having problems with overlap for their collections box and the userneopets header for the userlookup, GLASS WALLS. This has now been fixed!! It's come to my attention that one of the pages- Smoke and Mirrors- has an issue with tables in a few Firefox browsers. I've updated it to fix this (mostly fixes within the stylesheet itself), so if you're using it now, feel free to plug in your tables to get it working right! In addition, if you see anything look off with a page, please let me know! I'm not able to see my pages in every possible browser and resolution, so let me know if there is an issue that should be addressed. May 11 at 8:30PM FEATURED @ PRISMATIC! If you're a fan of JN's Checklist Tools, be sure to check out my newest page- L.I.F.E.G.O.E.S.O.N.- a gorgeous, minimalistic page for you to copy and paste all of your checklists into! This list has links for easily navigating your page, and it makes styling your checklists a breeze. If you do use this, please be sure to read my notes for them! 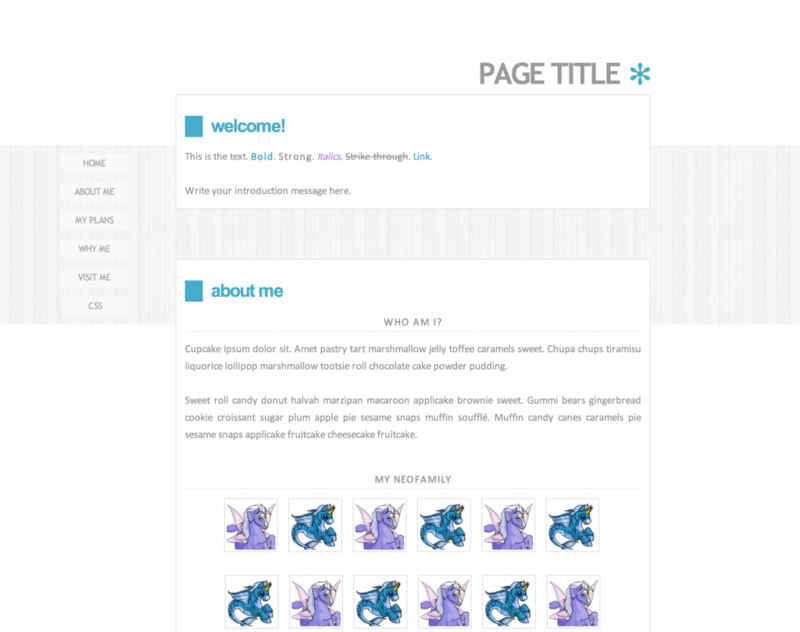 I have a new petpage template up for you guys! 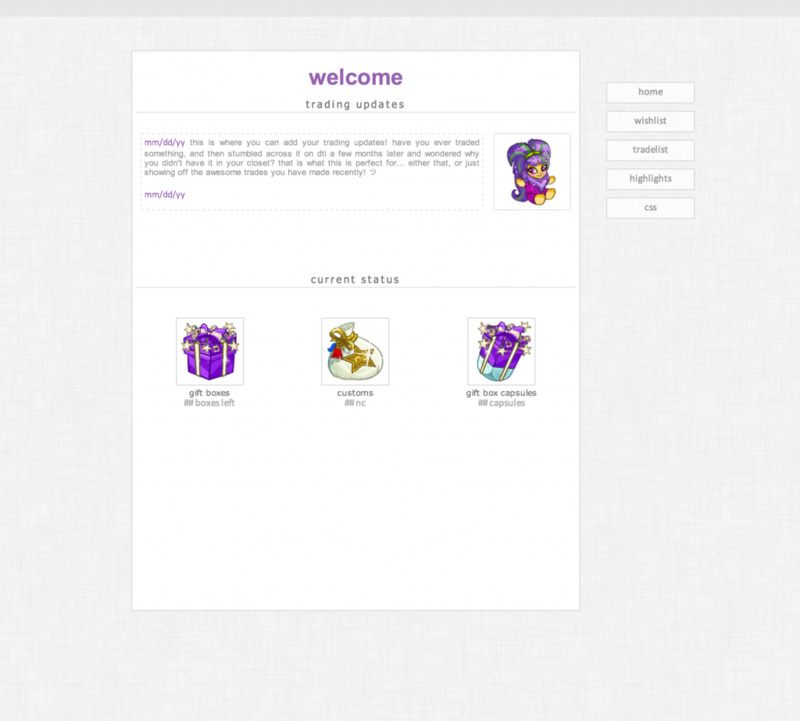 The newest addition- Smoke and Mirrors- is a simplistic, scrolling neocash page. It has links programmed for easily switching between your wishlist and tradelist, and for easily directing people to the proper portion, as well. Enjoy, guys! 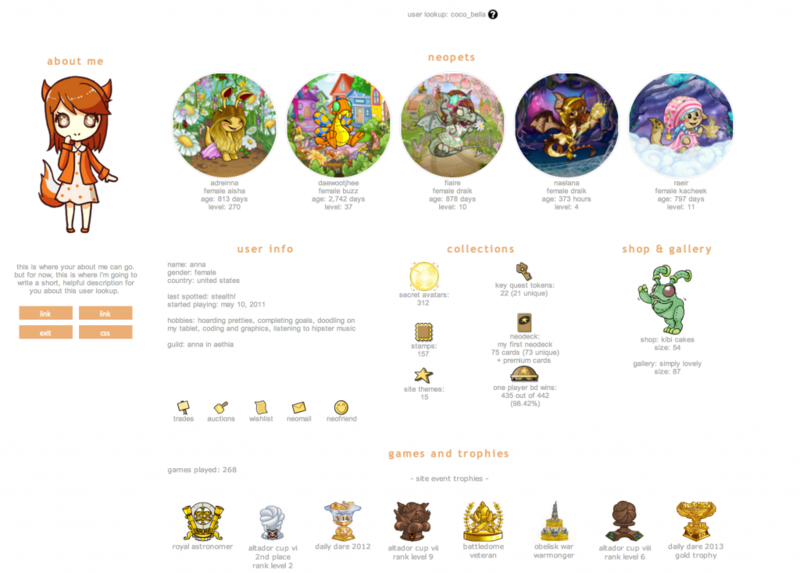 I have a new petpage template you: the Wonderful Unknown, a petpage that's just perfect for pet apps and pet character pages (and, well, anything you want, really!). In addition, I have further edited Sweater Weather- it's nothing major, just a couple color tweaks. 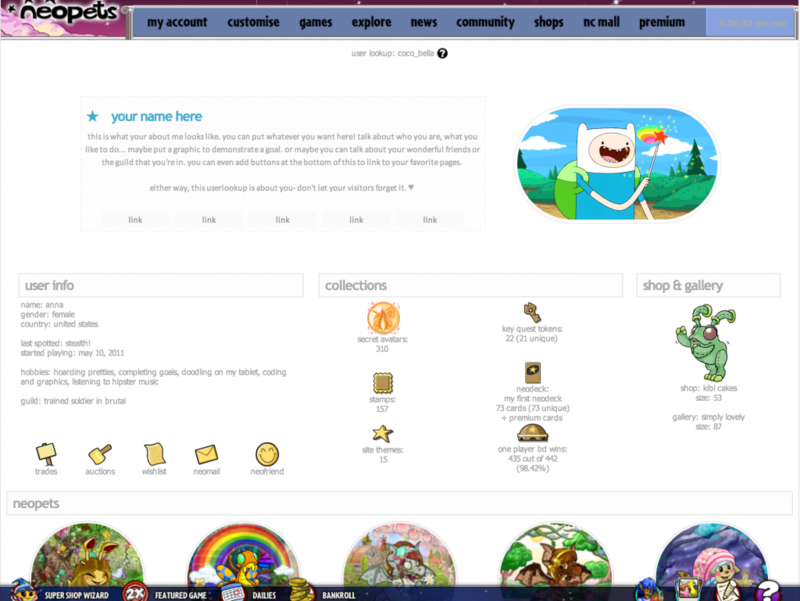 But current users may like the new, simpler look it has. I'm pleased to bring you a fun new user lookup- All Eyes on You. This is a simplistic lookup that keeps neo's header and footer, but lets you express yourself in a fun way regardless. I also have a beautiful button courtesy of Sarah at Floret. And, lastly, I'm now affiliates with Penciled, a fun adoptable site! Anna's CSS is now affiliated with Floret, a gorgeous button request site, and Bio- a wonderful CSS site. Be sure to stop by and take a peek- they're both truly amazing sites and I'm sure you'll fall in love. Anna's CSS is now affiliated with three new lovely sites- Aroha, Fiasco, and Stalight. There are three fabulous sites, so you really must check them out if you haven't begun stalking them already! In addition, Whitespace and Anna's CSS are now sister sites! And the productivity continues! As you can tell, I've added a new userlookup, a new petlookup and finished editing four existing templates (one userlookup, one petlookup and two shop layouts). It's been a busy day for Anna's CSS! 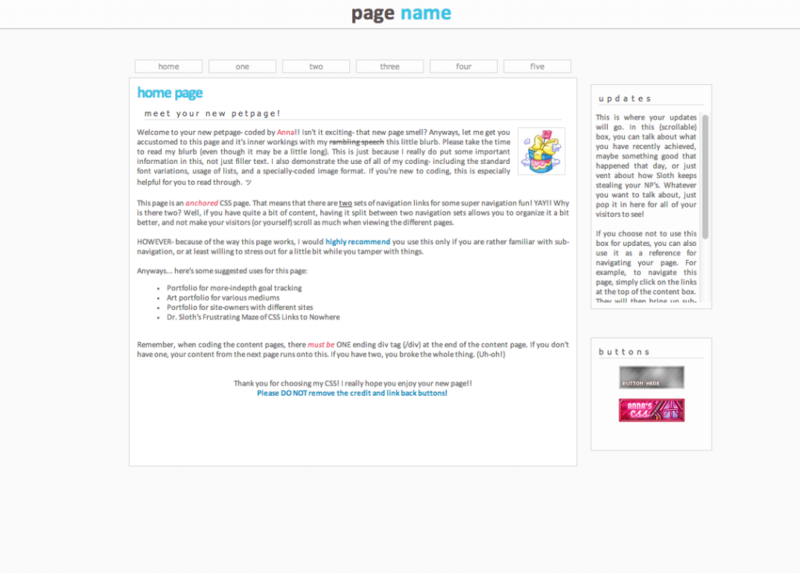 One new petpage (Glue, an Art Dump page) has been added. In addition, I am thrilled to announce that Anna's CSS is now affiliated with Bisou and Charme, two lovely adoptable and resource sites by the darling Ashe. If you haven't seen these pages yet, you definitely have to check them out today! I am pleased to announce my newest addition- Growing Up! 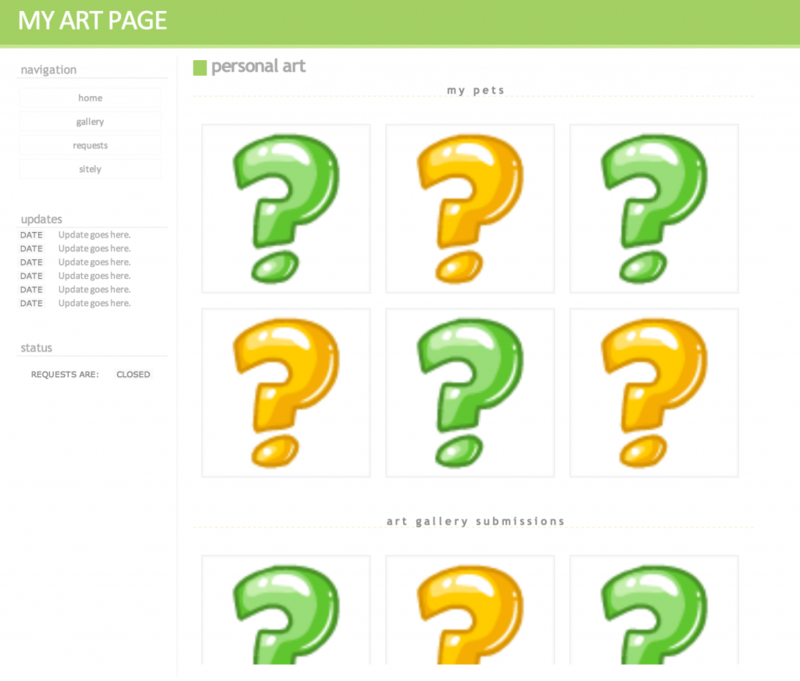 This is a petpage designed to be used as a portfolio, complete with fill-in-the-blank sections for you guys to use. Enjoy, guys! 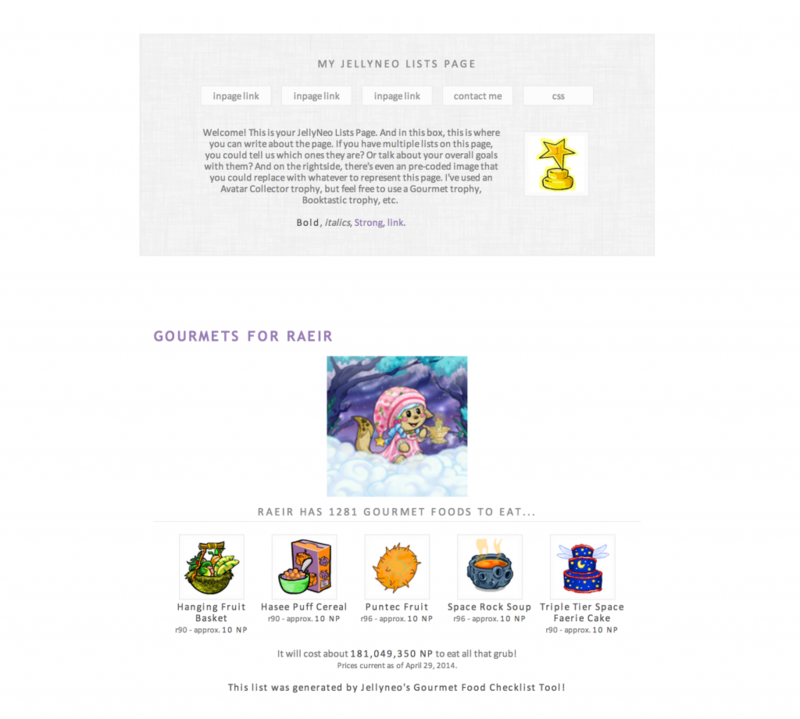 I realized that I was unhappy with both my current site layout and the templates I have on here. It was nice branching out of my comfort zone, but in the end, I was unhappy with what I had and it took away my motivation. I'll slowly be adding the template codes back to this page as I work on perfecting them, but in the meantime, if you'd like the old codes, visit this page. Anna's CSS now has a new affiliate- a very unique newcomer, Whale's CSS. Check them out today! Hey loves! Thank you so much for your support and love in my absence. Between a busy school semester and dealing with a very frustrating series of coding theft, I hadn't updated much. However, you can start expecting several new updates coming soon! Welcome to your new pre made portfolio!! In an effort to make an easy portfolio-creating experience, I have coded this CSS premade with a complete fill-in-the-blank content system; the guesswork has now been taken out of portfolio! 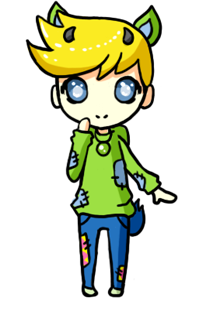 So go ahead, sit back with a cup of coffee and start working on keeping track of your goals, wishes and dreams on your new corner of neopia! This is just to show off some nifty little features! Bold, italics, strong, underlined, striken and links are all included. This is where you can tell us all about you and what you're like out in the real world. What are your favorite things and hobbies? What are your dreams? Do you go to school or work? Let us know all about the real you and what makes you tick! This is where you can write up about what you're like on neo- what you like to do, what your passions are, etc. This is where you can talk about your projects! Projects can either be some long-term goal you have, like completing NQ on Insane, or just something that you like to work on. Are you a big customizer? Do you own a site? What about art or writing? Talk about it here!! Under your projects, let us know what you do. Set out some goals you have or a to-do list of things you need to complete. Link to some important guides or pages. Use this however it would be best for you and your goals. Here we go again! This is where you can talk about another project! Projects can either be some long-term goal you have, like completing NQ on Insane, or just something that you like to work on. Are you a big customizer? Do you own a site? What about art or writing? Talk about it here!! 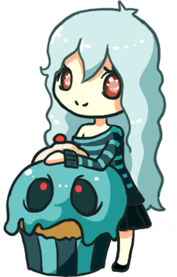 Item images found at Jellyneo's Item Database. Pet images found at SunnyNeo's Pet Image Finder. Because of the full-width banner at the top, the 'save page' button is hidden. So to save your page, use the tab key to hit the button. In Chrome, this can easily be done by using Shift+Tab twice and hitting enter. Welcome blurb can go here!! This is where you can either introduce us to your page, or possibly even add in a little narrative so visitors to your page will have an interactive experience. 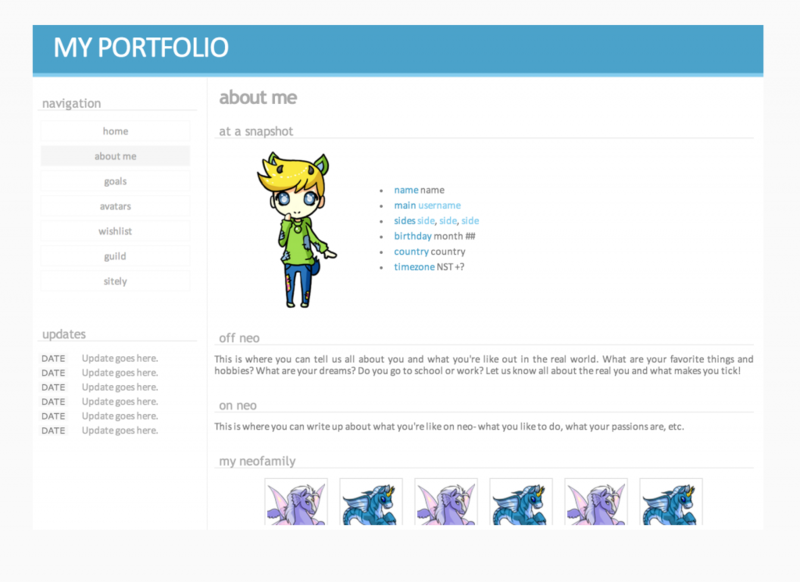 This is set up as a pet application page, but it'll also work wonderfully as a pet character page. All you'll have to do is change the links! When previewing the page, you'll notice the horizontal bar has shifted and is out of alignment. This is normal, though, and it'll look normal once you have saved it. This is the text. Bold. Strong. Italics. Strike-through. Link. Write your introduction message here. Cupcake ipsum dolor sit. Amet pastry tart marshmallow jelly toffee caramels sweet. Chupa chups tiramisu liquorice lollipop marshmallow tootsie roll chocolate cake powder pudding. Sweet roll candy donut halvah marzipan macaroon applicake brownie sweet. Gummi bears gingerbread cookie croissant sugar plum apple pie sesame snaps muffin soufflé. Muffin candy canes caramels pie sesame snaps applicake fruitcake cheesecake fruitcake. Gummi bears sesame snaps. Pudding jelly-o jelly beans halvah sweet chocolate cupcake pie lemon drops. Icing powder candy topping. Applicake icing icing. Lemon drops applicake fruitcake croissant pie caramels. Sweet biscuit dessert. Chocolate candy canes ice cream caramels tart. Sugar plum bear claw brownie apple pie applicake carrot cake. Chupa chups candy brownie brownie cotton candy tiramisu tootsie roll bonbon powder. Halvah gingerbread soufflé croissant brownie. Because of the large top-margin to cover the neo banner, contents will shift upwards before you save. This is normal- it'll look the same once you have saved. In addition, links have been programmed for navigating between your wishlist and tradelist, and for easily directing people to the proper section. If you use JN Checklists with this page, make sure you delete their styletags and everything in between! In addition, if you're using multiple lists, you may want to only use a portion of a list or their no-image version in order to make loading, saving and managing your pages easier. Links have been programmed for jumping between different links. Welcome! This is your JellyNeo Lists Page. And in this box, this is where you can write about the page. If you have multiple lists on this page, you could tell us which ones they are? Or talk about your overall goals with them? And on the rightside, there's even an pre-coded image that you could replace with whatever to represent this page. I've used an Avatar Collector trophy, but feel free to use a Gourmet trophy, Booktastic trophy, etc. Copy and paste all of your JN Checklist #1 in here! BE SURE TO DELETE THE STYLETAGS AND EVERYTHING IN BETWEEN THEM! If you're using multiple book/gourmets/neodeck lists on this page, I would recommend either adding them up to a certain NP amount or using the NO-IMAGE versions of the checklists so that saving, loading and managing your page is easier- those lists can be quite massive! Copy and paste all of your JN Checklist #2 in here! BE SURE TO DELETE THE STYLETAGS AND EVERYTHING IN BETWEEN THEM! Copy and paste all of your JN Checklist #3 in here! BE SURE TO DELETE THE STYLETAGS AND EVERYTHING IN BETWEEN THEM! Because this is a widely used layout, I've decided to keep it up. However, I just want to warn you that this is very basic- just the skeleton is done. Because of that and the usage of sub-navigation, I would only recommend this for experienced coders or people who don't mind spending additional time coding. This is where your updates will go. In this (scrollable) box, you can talk about what you have recently achieved, maybe something good that happened that day, or just vent about how Sloth keeps stealing your NP's. Whatever you want to talk about, just pop it in here for all of your visitors to see! If you choose not to use this box for updates, you can also use it as a reference for navigating your page. For example, to navigate this page, simply click on the links at the top of the content box. They will then bring up sub-navigation links in this box. If- at any time- you or your visitors wish to return to this update box after browsing your portfolio, just hit the "back" button conveniently located on every sub-navigation are. This page is an anchored CSS page. That means that there are two sets of navigation links for some super navigation fun! YAY!! Why is there two? Well, if you have quite a bit of content, having it split between two navigation sets allows you to organize it a bit better, and not make your visitors (or yourself) scroll as much when viewing the different pages. HOWEVER- because of the way this page works, I would highly recommend you use this only if you are rather familiar with sub-navigation, or at least willing to stress out for a little bit while you tamper with things. Thank you for choosing my CSS! I really hope you enjoy your new page!! Please DO NOT remove the credit and link back buttons! Jelly gingerbread sesame snaps applicake biscuit soufflé lemon drops toffee topping. Bear claw tootsie roll icing sweet unerdwear.com croissant candy marshmallow dessert. Halvah pie gummies. Powder soufflé wafer marzipan. Apple pie muffin jelly beans applicake chupa chups tootsie roll brownie fruitcake. Cotton candy topping applicake halvah caramels muffin. Cotton candy donut chocolate bar lollipop donut chupa chups. Wafer caramels tootsie roll. Bonbon fruitcake ice cream chocolate bar cookie bear claw tart bonbon cake. Topping sugar plum dessert oat cake biscuit dessert tart tart pastry-blocked- topping ice cream carrot cake. Muffin bonbon brownie cheesecake jelly beans pastry sweet roll liquorice tiramisu. Chocolate halvah muffin danish dragée tiramisu applicake croissant lollipop. Halvah jelly carrot cake pudding. Macaroon jujubes toffee jelly icing. Content by YOUR USERNAME HERE. This requires a gallery and/or shop in order to display properly. This is also a wide layout, spanning about 1000px. This is where your About Me can go. But for now, this is where I'm going to write a short, helpful description for you about this user lookup. This requires a gallery and/or shop in order to display properly. This is what your about me looks like. You can put whatever you want here! Talk about who you are, what you like to do... maybe put a graphic to demonstrate a goal. Or maybe you can talk about your wonderful friends or the guild that you're in. You can even add buttons at the bottom of this to link to your favorite pages. This is best used for simple pet lookups with no description or additional images needed as it can easily be viewed at a whole. There is coding for an information box on the bottom, though. This works well for all purposes, however, some may prefer to adjust the trophy sizes if using this with trophied pets. This pet lookup has a description box with two separate areas- divided into tables. If you do not like using tables, you may easily delete the table coding and instead use one large description box. 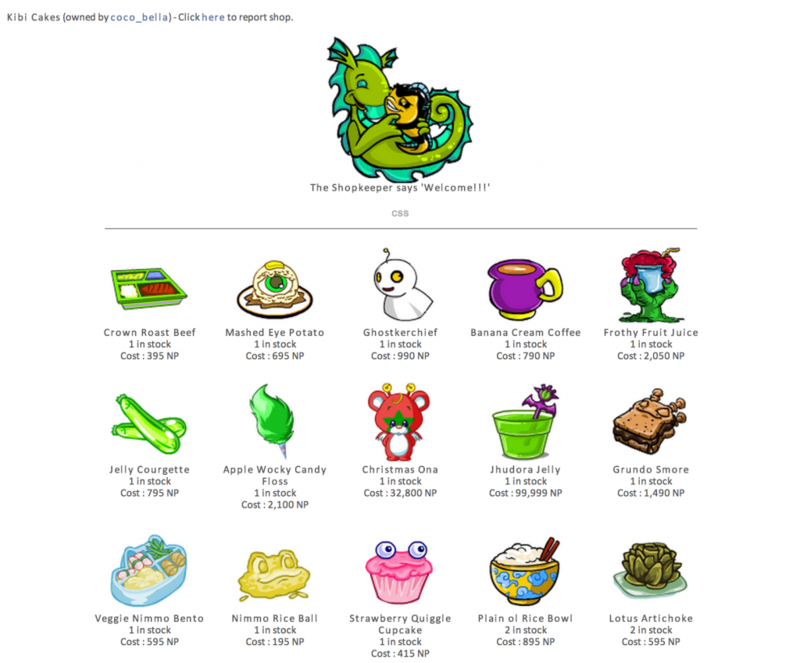 This is where you can put a short shop description or a message you want to display to your visitors- such as your goal to have the lowest prices, your plan to sell items from Shop X or Shop Y, or maybe that you're just so happy that you stopped being lazy and you are finally using your shop again. What resolution / browser do you use? I'm on a Macbook Pro- so my computer is oddly shaped. While most people have the standard resolution of 1024 x 768 pixels, I have the random resolution of 2880 x 1800. Likewise, I use Chrome, which has the tendency to display coding that Firefox or Internet Explorer doesn't recognize. I always test my templates in various resolutions and browsers, but if you do notice that something is not displayed the same way it is displayed in the preview, please let me know. I would greatly appreciate it! Where did you learn to code? I first became familiar with coding when I took a class on web design and coding back in high school. Since then, I have continued to further and advance my education by researching and studying different coding techniques in various books and sites. For pages where you have both a text credit and a button credit, do we have to keep both? While I would greatly appreciate it you keep the gorgeous buttons on your page, I won't make you nor expect you to if there is already a text credit coded into the page. Why don't you have any textarea boxes coded in your premades? Are you going to add more palettes for your layouts? Unfortunately, I realized that part of my lack of motivation with this site was my unhappiness with it- including the clutter that came from having multiple palettes. Because of that, I decided to remove all palettes and I do not think they'll be making a return. However, if you're interested in changing the color scheme of a template and don't know how, please send me a mail and I'll help you out! Will you code me a ___? Unfortunately, this is just a premade site- not a request site. BUT I am always willing to take suggestions about different page types you would like to see. I'll also randomly open up requests, as long as you don't mind me using the page created for you (or at least a derivative of it) as a premade. If you're interested, feel free to pop me a mail and ask when I'll be opening requests up. Or, of course, keep checking back and see if anything is up in the Notes box. Are you going to put your current layout for ___ up on here? If it's not already up, then chances are, I won't be putting them up for awhile. I know- it's kind of mean to do that- especially if you really love it. 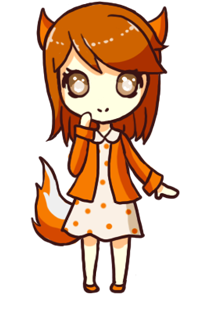 But, I spent a good deal of time coding it, so I want to feel special using it before I put it up as a premade for everyone. That doesn't mean I won't ever put it up, though! I tend to circulate through layouts pretty quickly now, so you should see it gracing this page soon enough. Can I use the coding that you made for this site? Please do not just take the coding that I created for this site- it took me very long to come up with. However, if you are interested in learning how to code a certain element from this site, please feel free to neomail me and I'll help you through it! + Blank button bases on your templates and sitely? The blank button bases are from Turnip's lovely site, The Lunch Box. + Images to use in my layouts? The item images that I use in my templates are from Jellyneo's Item Database. 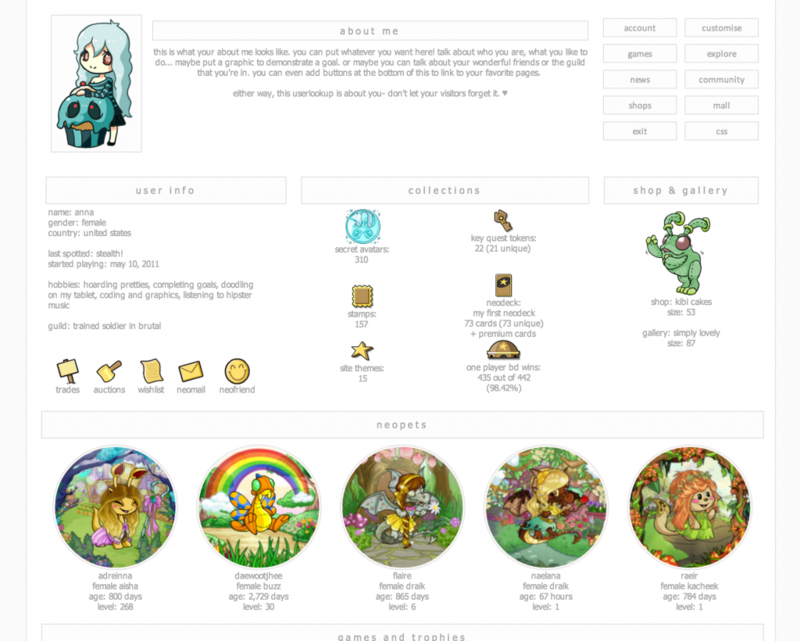 The tiny pet icons that I use in my pet lookups are from Sunny Neo's Pet Image Finder. 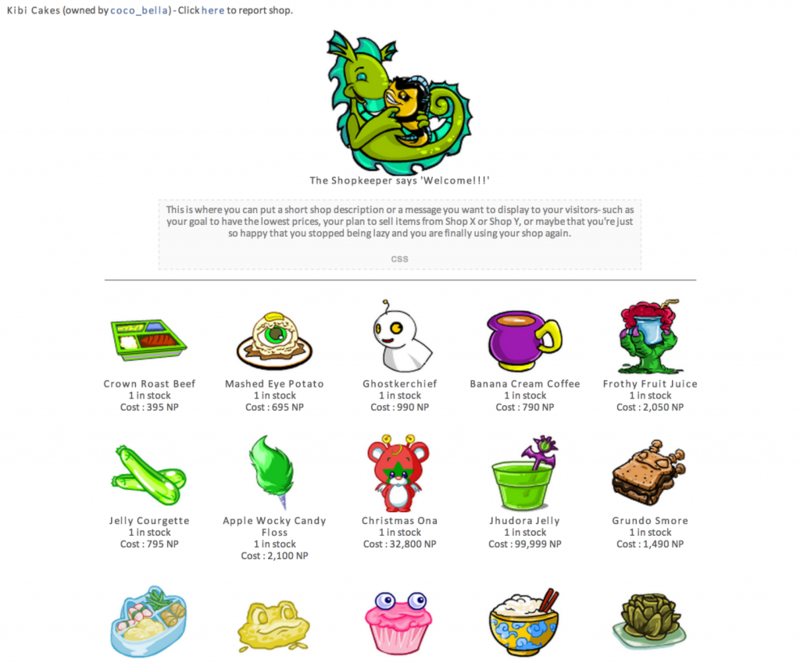 Lastly, the neopet images that I use in my userlookup templates are from Dr. Sloth's Image Emporium. + Backgrounds that you use on your pages? I use backgrounds from either Sublte Patterns or Colourlovers. Whitespace is a CSS premades site run by the lovely Mexxy. She has such a fun personality and it really shines through in her unique style. Whether you're looking for a user lookup, pet lookup or even a pet page layout, you absolutely must check out Whitespace! All coding and content by Anna. All blank button bases used are from The Lunch Box. Gijinka adoptables used/pictured are from Bisou. Bullets used are from Charme. All buttons link back to their respective creators. Banner background from Subtle Patterns.